Home /Flowers and Horticulture, Outdoor Lore/Noxious Weeds …or Are They? “Home” was Holland, or The Netherlands, where I grew up. After an extensive period of traveling, I ended up in Idaho, eventually met my husband and moved to his home on almost six acres, in the state of Oregon. The little black birds, I later found out, were quail, the grain was cracked wheat, and as he had mentioned, hundreds of tulips emerged this spring from under that snowy cover. It was a gorgeous sight! Being raised in a country that is one of the largest flower-producers in the world, I loved anything that bloomed, blossomed or simply grew out of a tiny seed; so as soon as the weather allowed, the dogs and I went exploring beyond that large strip of flower beds in the backyard to see what else was growing on our acreage. It had been several years since any livestock had lived on the property. Both the pasture and the wooded area behind our house proved to contain an amazing wealth of new flowers and plants, many of which I had never seen before, but were oh-so-pretty! Beautiful purple flowers on high spikes mingled with reeds on the side of the irrigation canal, lovely strands of white and pink morning glory covered large patches of pasture, and all along the driveway we had hardy green groundcovers with cute little yellow flowers. As the days grew longer and the weather warmed up, more and more plants and flowers would appear, sporting the most interesting leaves, flowers and colors. One of my desires was to create a butterfly garden on our property, and I was delighted to see nature had provided such a colorful and diverse start. However, I wasn’t so enthusiastic about those odd stalks that grew all over the property, sometimes in clusters and sometimes by themselves, with large silvery leaves and little, clustered star-shaped flowers. They didn’t look pretty, and they didn’t smell nice as far as I could tell, so my practical mind and attitude went to work and I spent the whole day yanking these odd intruders out of the soil. Besides being offensive to my sight, they were also excreting a milky substance which was surely highly poisonous! As to prove my point, that night I broke out in a rash which first sent me searching through our bathroom drawers for an anti-itch cream, and then onto the Internet to find out what this horrible plant could be, but most of all, how to get rid of it for good! The search proved to be an eye-opening, and horrifying, experience. Typing “noxious weeds” into the search bar took me to the USDA national database with a large listing of all noxious and invasive weeds, by state. As none of the scientific, nor common names, meant anything to me, I decided to click on each listing separately and look at the photographs included, to see if I could identify this plant. And as I viewed and read about each weed, my heart sank deeper and deeper. The groundcover that graced our driveway turned out to be Puncture-vine (Tribulus terrestris), a weed that grows burs so hard it can puncture bicycle tires (imagine what it will do to your foot!). The purple spikes at the edge of the irrigation canal are Purple Loosestrife (Lythrum salicaria). It aggressively pushes out plants with nutritional value for wildlife but offers none itself, and the “Morning Glory” is none other than “agriculture’s twelfth most serious weed species”, the infamous Field Bindweed (Convolvulus arvensis) which seed can remain viable in the soil for fifty years. But worst of all, the milky stalks I had been removing from our acreage, were part of the one plant that would feed the butterflies I so longed to provide for, the common milkweed (Asclepias syriaca). 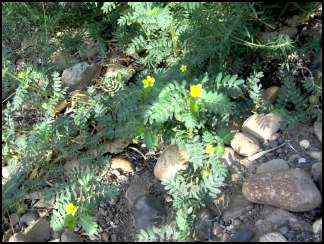 Puncturevine (Tribulus terrestris) is surely not a groundcover by choice! Needless to say, I had my work cut out for me. During the next couple of days, I read up on every possible plant I recognized from their online “mugshot” and marked them on our property. Some of them were poisonous to livestock (and humans), so I focused on those first. The plants that had not gone to seed yet I pulled from the ground (with gloves on) and laid them to dry on the burn pile. The weeds that did go to seed I tried to remove as carefully as possible. Various websites suggested placing a container or a plastic bag over the plant before removing them, so the seeds don’t spread. But what was I going to do about the milkweed? Several new plants had sprung up, both in the pasture and in my flowerbeds. 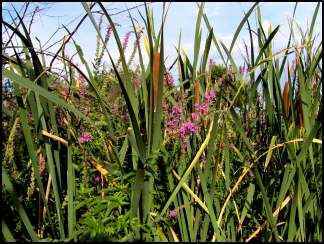 And although not considered dangerous to our health (or to the cows or chickens) unless it was eaten in large quantities and without proper preparation, it was still considered a noxious weed. Once considered an ugly intruder, the Asclepias Syriaca is now welcomed into my butterfly garden! The Asclepias syriaca, or common milkweed, is invasive (hence the fact that shortly after I pulled each and every plant in sight, there were new plants growing everywhere), it absorbs nutrients and water more quickly than many a crop, and with each seedpod containing about 500 seeds each, I rested in the knowledge that the milkweed and I were going to be long-term friends – or foes, depending on how you look at it. Decisions, decisions! 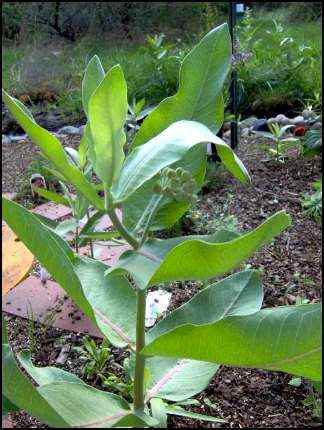 Milkweed is a must for the Monarch butterfly, as the larvae will feed off the plant. I definitely wanted to create a safe haven for all critters, flying or not. 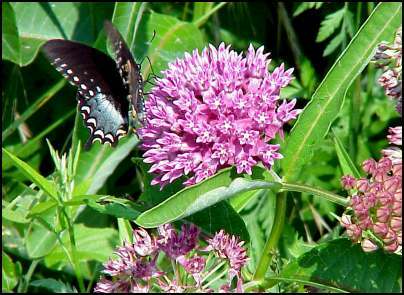 So after some good and hard thinking, I decided to remove all milkweed plants from the pasture area but leave them in my butterfly garden. It has been a privilege to see a few Monarch butterflies, whose lives depend on the availability of these plants, visit my garden. As for the rest of the weeds, several times a week now, I walk the property and look out for new outbreaks of the various noxious weeds that I identified earlier this summer. Once familiar with the leaves and the way the plant grows, it becomes easier to spot them right away and remove them before they can go to seed, or do any mayor damage. If you are new to the area where you are homesteading, or find an unusual plant or flower on your property, contact your county weed superintendent, or county extension office. There are also online resources to help you identify the “intruder”, and the URL mentioned above is a great start. You may also want to check with your local authorities and see if they provide additional, area-specific information, or workshops on the topic. They are also great for identifying any weed you may find on your property that cannot be recognized with the current listings. Although now less colorful, I know that our pasture is healthier for our soon-to-be-purchased livestock, and with the help of a local nursery and several online resources, I was able to make up for my terrible milkweed mishap with a thriving butterfly and hummingbird garden. The milkweed stalks that I so brutally removed earlier this spring have grown back and are sporting huge clusters of flowers. Unfortunately, they are also developing equally huge seed pods. Tomorrow morning I will, sharp knife in hand, pay a visit to my friend the milkweed, and remove these green tear-shaped pods from its stalk. There is no doubt in my mind that I will miss one or two on our acreage somewhere. At 500 seeds a pod, it will mean that next year I will be busy chasing down every growing weed in our pasture again, but hopefully with a butterfly or two happily flying along.